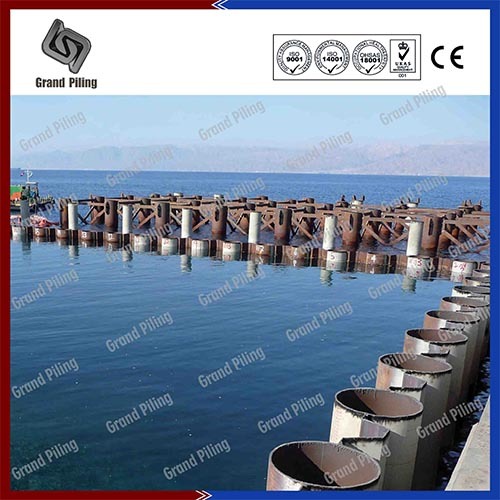 This is another big tubular combined walls of sheet pile and steel pipes Grand Piling has done for oversea market. Steel pipe dimensions are 1219x18, X52 steel grade as per API 5L standard. We also supplied the sheet piles and the interlocks. Total quantity is over 5000 tons,and we use bulk vessels to ship to Chile port specially. Some pipes are painted in this order. The painting system and surface preparation of the steel Piles and sheet piles including other accessories had to cater for the environment category of C5M as stated in BS EN ISO 12944 and ISO 9223. The coating comprised of two layers of epoxy mastic totaling 400 um dry film thickness. Jotamastic 87 was used for this task. The surface preparation was sandblasted to SA 2.5 according to ISO 8501-1. All the sheet piles, tie rods, waling beam and other steel items were provided with these protective coatings.